Service Rank and Number / Rheng gwasanaeth a rhif: Company Quartermaster Sergeant. Military Cemetery/Memorial / Fynwent milwrol: Holywell Cemetery, Flintshire. Ref No Grave or Memorial / Rhif cyfeirnod bedd: Plot: R. Row: C. Grave: 35. Died on Monday 21 May 1917 aged 47. Alfred Thomas Hinsley was born in Carlton, Selby, Yorkshire during October 1869. The 1881 census tells us that the family lived in Low Street, Carlton, Selby, Yorkshire. The head of the family was Thomas Hinsley aged 47, who was employed as a Gardeners Labourer. His wife Bridget Hinsley (nee Ryan) aged 45, who was born in Galway, Ireland. 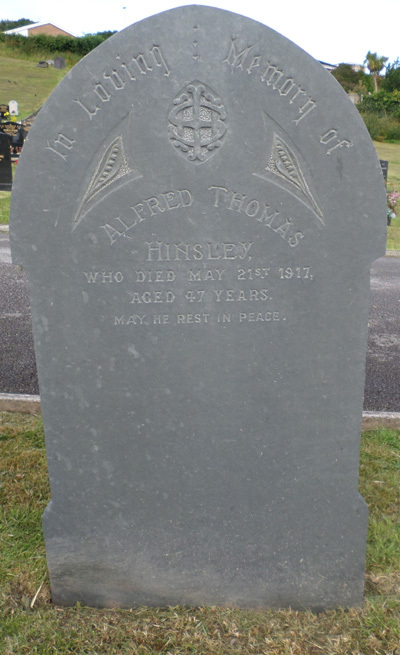 They had one son – Alfred Thomas Hinsley, aged 11 years. Thomas Hinsley died aged 50 in 1884 and his wife Bridget died on 29 December 1890 aged 54. The 1901 census shows that Alfred is now married to Frances Bacon Hinsley aged 33. He is employed as a Foreman in a Joinery Shop. They live at 75 Kilburn Lane, Willesden, London and have three children – Edna Mary Hinsley aged 6, Beatrice Annie Hinsley aged 5 and Ernest Thomas Hinsley aged 2 years. By 1911 the family have moved to 1 Callcott Road, Brandesbury, London NW6, which is situated in an extremely affluent area. Thomas is now employed as a Clerk of Works and they now have three additional children – Madeline Hinsley aged 9, Muriel Frances Hinsley aged 7 and Agnes Hinsley aged 6 years. Alfred Thomas Hinsley initially enlisted with the Royal Welsh Fusiliers at the Drill Hall, Halkyn Street, Holywell before transferring to the Royal Defence Corps. There is no record of the family living in Holywell but we do know that Alfred is buried in Holywell Cemetery, Fron Park Road, Holywell. On 8 October 1917 a payment of £1.19s.0d was made by the War Office to Frances Hinsley, this being monies owed to her husband Alfred. On 31 October 1919, a further payment which is recorded as a War Gratuity of £12.0s.0d was also made to her. Alfred’s grave is at Holywell Cemetery, Fron Park Road, Holywell, Flintshire and overlooks the Dee Estuary. Photograph taken of the headstone on Friday 10 July 2015, by Olive and Geoffrey Mitchell. He is remembered on the North Wales Heroes Memorial Arch, Deiniol Road, Bangor, North Wales.